One of the critical factors in determining the size of a “whole house” water treatment system, whether you are removing iron from well water or chemicals from city water, is the rate of service flow you need. To work effectively, the filter must be large enough to handle the volume of water, in gallons per minute (gpm), that you plan to run through it. Undersizing reduces water pressure, shortens the life of the filter, and compromises quality. The problem starts when you look at a chart of flow rate recommendations for the various filter media. If you have a family of four, for example, and live in a home with two bathrooms, you’ll see from the chart above that you need to size your filter for a 7 gallon-per-minute flow rate. However, if you plan to purchase a Birm filter to remove iron from your well water, the flow rate chart will tell you that a 13” X 54” filter would provide a service flow rate of only 3.9 gallons per minute and even a massive 16” filter would give you only a 5.9 gpm service flow. Note also that to backwash the 16” filter you would need 15.4 gpm, which your well probably isn’t capable of. Faced with this dilemma, you could install two 13” filters side by side so that each has to handle only half the service flow. This gives you almost 8 gpm. 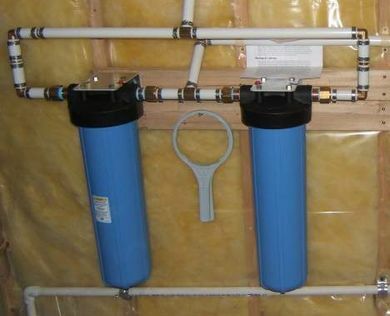 If you backwash the filters separately, they would need only 10 gpm, which your well will handle. Should you use the two 13″ filters installed in tandem? Probably not, unless your home requires long, sustained service flow rates, and this rarely happens in residential applications. The reality is that even though 7 gpm is a good figure to keep in mind, most residential water use is at the rate of two or three gallons per minute. It’s also true that you can over-run the recommended rate limit now and then without fear of getting arrested. The imaginary family of four in a two-bath home, in fact, usually gets by very well with a 12” X 52” or even a 10” X 54” Birm filter. And it really helps if you use common sense and arrange things so that a dishwasher, a clothes washer, and a shower aren’t in use at the same time. Briefly violating the “speed limit” with an occasional burst of 7 gpm usually doesn’t result in a noticeable bad result. Among the most troublesome sizing problems are chloramine filters for city water users. Chloramines are hard to remove and require a slower flow rate than chlorine. Recommended flow rates for Pure Water Products’ “Chloramine Catcher,” for example, which were based on the catalytic carbon maker’s flow rate recommendation, allow only 6.25 gallons per minute for a 13” filter. It would be common, nevertheless, for the hypothetical 7-gpm family to use a 10” X 54” filter, which is recommended for a flow of only 3.25 gpm. Usually a 12″ X 52″ chloramine filter will perform excellently in this situation. Going over the recommended rate from time to time might allow less-than-perfect performance from the filter (probably not noticeable), or it might shorten the life of the carbon a bit, but it won’t break anything or get you arrested. Realize that irrigation doesn’t fall under to the 7 gpm rule. If you plan to run water for hours on end from your well and don’t want iron to stain your driveway, you’ll need to find an alternative solution. The two 13” filters we discussed above won’t handle it. In fact, filtering water for lawn irrigation and filling large swimming pools fall under a whole different set of rules. Keep in mind, too, that if you are filtering water for a sustained flow to a dialysis machine or feeding a fish pond with many gallons of water from a chloraminated source, you are advised to follow the rules strictly. It is easy to provide sufficient service capacity with cartridge-style filters by using them in tandem. In the installation above, the installer has split the service flow so that each of the filters with a 5 gpm capacity is handling half the service load. More about this.